~ We bought $450 worth of milk powder. 12 1.6kg tins of milk which i estimate will last us till the end of the year. We saved about $60. and got more free sachets of milk powder that will last us another 2 weeks. + a $10 NTUC voucher. It hurts buying in bulk. but if i divide by the months...actually that's about how much i'll spend too. gosh...the milk company ppl must be happy. ~ We would have spent another $120 buying 3 boxes of Pampers Active diapers that can prob last us 1 3/4 mths of diapers. but it was such a good deal (50% off for premium diapers), that it was gone when we got there. gee. 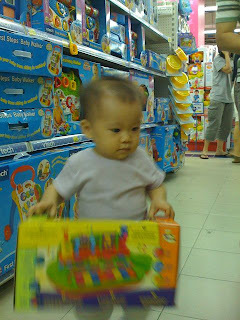 (have i also mentioned that i got 6 packs of Pampers babydry & 4 packs of Pampers active at home?) talk about stocking up! I don't wish to buy diapers and milk powder for a loooooooong time. ~ I sense Eliza entering the TERRIBLE TWOs stage. It's the beginning. I sniff a bit of it. Oh let me enjoy the compliant her as much as i can while it lasts. She occasionally breaks into terrible tantrums if she doesn't get her way. Very stubborn at getting what she wants sometimes. I'm saying sometimes because it doesn't happen much, and i had recently found myself doing a lot of negotiating with her that i'm so drained out after that. ~ Eliza is sensing her freedom to move. Her walking is getting better and better such that she can walk fast, though not yet run. 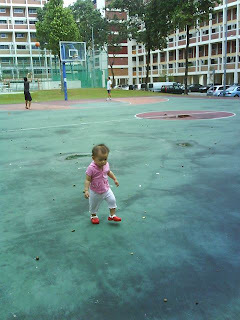 She has also mastered getting up and down one step, ie at the kitchen and balcony. At the same time she also started going up the stairs on her own. As out house isn't at the lift landing, usually we'll need to climb one storey up to take the lift. Earlier on, she'll zoom out of the house, to the stairs when we go out (leaving me to quickly lock the door and pick my things before she moves up the stairs). I'll usually support her as she 'walks' up the stairs, one foot at a time. She has no time to stop at every step. 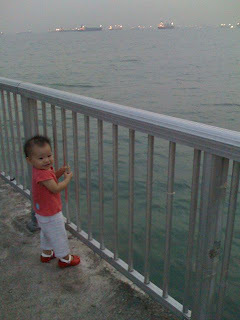 This weekend she realized she can do it on her own, by holding the railings. which means she'll be up 4 steps by the time i reach her. 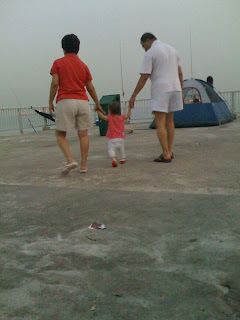 On top of that, she's reaaaaalllly happy to walk on her own....just tottering around...like how she walked from our home till almost near tamp jumction...it's the last hdb before we reach the main traffic lights...still it WAS quite a distance for a little toddler! ~ Eliza's into playing on her own. She can keep herself well entertained doing some things she gets engrossed in. ie. arranging the things on the coffee table to the sofa, throwing off the table mat and arranging the things from the sofa back to the table. great. she also stacked the coke cans we couldn't finish for CNY. ~ the power of imitation...or more like actions-speak-louder-than-words phrase is powerful. i mean we teach her loads of stuff, ask her to do this, do that. throwing away diapers was one of that. 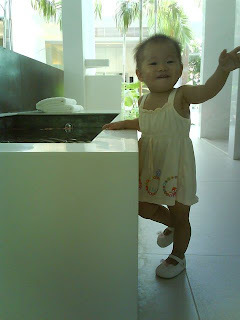 obviously she sees us throw away diapers and other stuff in the bin, so she follows suit too. though the diaper throwing garners a lot of praise and encouragement from us...so much so she'll also do it without being asked to. saying grace before dinner was another powerful one. i pray with her during bedtime and mealtimes but she is always so distracted with something else that she pays little attention to me (or that's what i think). but once, Ww and i prayed before our dinner (and Eliza usually joins us)...and the rest is history. She'll always put her hands to prayer when we come to eat, it lasts only a few seconds but it's a great reminder for us. ~ PART OF LIFE stuffs. these are things that Eliza sees as part of our daily life stuff, part of routine stuff. she has seen it so often, experienced it so often that it's normal. ie it's normal to pray before we eat. it's normal to read before bedtime. it's normal that we change into home clothes when we come home, it's normal to read frequently. in one of the sermons by Mark Discholl, he was sharing about family life, and what he does at home that his kids see becomes ingrained in them that it's a normal thing to do. like for them, that it's normal to discuss the bible over dinner, it's normal to read a lot (like their daddy). i felt so impacted by the fact that our actions or more like our life is a living testimony to our kids, right from day one. The goal of parenting is to have children whose hearts love Jesus. This is random...everyone at home is enjoying Eliza so much (despite her outbursts when she has to take her meds...and we have no choice but to force her even though she'll shake her head and run away). We have been seeing Eliza signing a lot more these days. Somehow she's not at the stage to talk yet. (ww's colleague's daughter who is about 1mth younger than her can utter quite a few words and even two-word phrases...i'm like wow...) So Eliza still at the signing stage and i think i've accidently heard her mumble words like 'toothbrush', 'bao4 zhi3', 'banana', 'bye bye', 'hai' and 'apple'. That's about it..and i barely heard a repeat on it anymore. I managed to get Signing times 3-8 which are more for older kids and found that i still preferred Baby Signing Times cos it has more music. Trying to get hold of the vol 3 & 4 cos it just came into the market Oct last year. 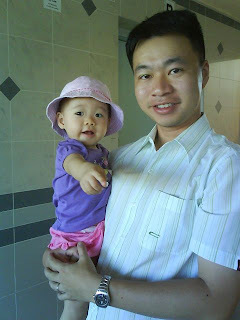 It takes a while for me to figure out some of the signs cos she's i guess her finger works aren't that developed yet. So somehow or rather, all of us get to learn her kind of sign. Even baby sign isn't the same. But it's really cool watching her learn all these stuff. 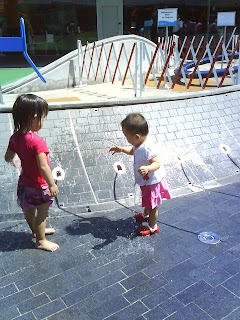 Well it all started with our fun trip to Sentosa...actually it was the water play at Marina Barrage. She literally jumped into the water, right off our hands. I didn't have any more spare clothes so she played in her diapers. Not too good idea cos it was evening and it was windy. 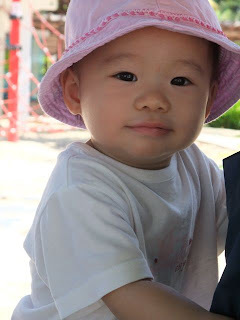 Oopss..
Ww saw her nose runny while in the pool already, and she was shivering. So she was most likely sick cos of that. Oppps. Lesson learnt...rather let her cry than go in there. Then again her cousins were in there splashing themselves wet. How could she miss it? She had runny nose for about 2 days till on Friday night it started to get worse, as in i could hear her trying to cough out the phelgm. So it was to the doctor on Saturday morning. 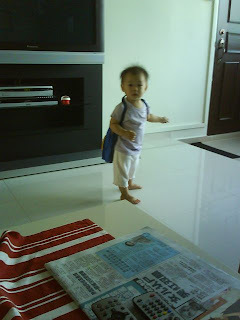 Here's Eliza with her little bag as we go out to see the doctor. She's excited about going out. Oh on a side note: I discovered at the clinic, while the nurses were pinning her down so the doc and check her throat, that she has a new molar!! quite interesting...i thought it comes after those vampire teeth comes out. so when we went home to check, she's also growing another molar on the upper gum! and her right gum looks swollen, so here comes molar no.3! 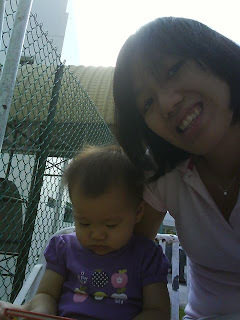 gosh..no wonder she's drooling so much these few days...have to take out her bibs again. Stayed home with Eliza all saturday doing stuff i don't remember now. Passing the day with her is kinda more interesting now that she can keep herself entertained. I was making the bed in the room while she was at the balcony busying herself with the tin of cards that i dropped earlier. And she was slotting the cards between the timber deck and the floor and sliding it out to the edge. Before that she was playing hide and seek with me amongst the bedsheets that i've brought out the the balcony to dry. Everything can be a toy. 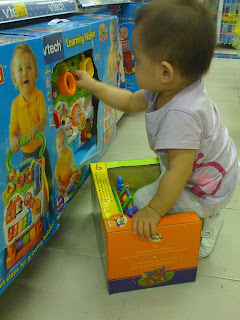 So even when i dropped by to Taka Baby Fair, I browsed all the toys but didn't feel there's any much that she needs. (ok only one really fun percussions set...that's $55. but i didn't bring the Taka vouchers so i didn't get it eventually). The toys that she got for her birthday is quite good enough. So far one of the most useful toys are her car/scooter, her books and this stacking cups that seemed to have multiple uses. 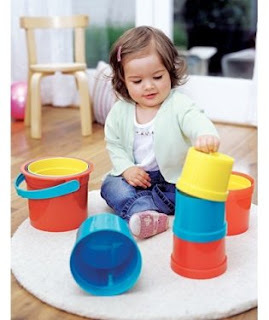 Yeah, it's a bath toy, you can stack it up to a tower, or match colours, or collaspe them. Got it from mothercare for $7 quite a while ago...looks like that but not as large..and it isn't like a bucket..still it's been useful. Anyway on sunday, we made it to church without Ww who was at BB camp. And even went out to OG with my in-laws and dinner at Market 85 after that. So much for being sick eh? After that i was the one being quite bished out that I felt sick. Let's pray she gets better soon...it's scary hearing her breathing at night, sounds like darth vader sometimes; else she'll get into some coughing phelgm out part that sounds so frightening (to me at least) that i'll jump out of bed. 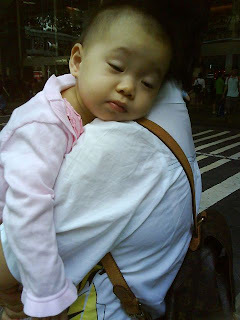 This was last last friday, after the IT fair...we were waiting for the bus and Eliza was still sleepy from her nap...she was peeping to see where we are and promptly dozed off. She slept all the way back. 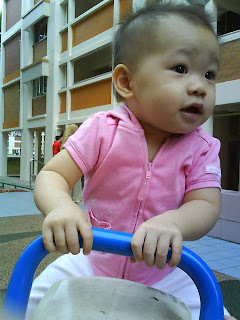 Last last saturday, I brought her to the library, but as we passed by the playground, she flew off my arms and headed for it. They know what a playground is quite early on. Last thursday, we made another trip to the library, National library that is. Love the expanse of space she can toddle around. The highlight of this week was SENTOSA! 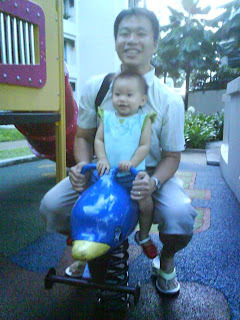 I had deliberated on whether to go Bird Park or Sentosa earlier in the week. 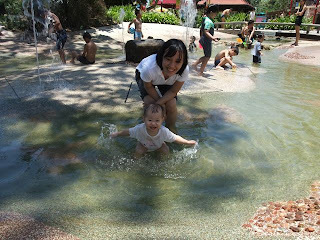 But since Sentosa has the beach, it will be good for the boys and Eliza to go play. It's also cheaper. Per entry per person was $3 cos Ww's dad drove his school bus van and they charged us $10 for the vehicle. That's about all we spent on top of food. 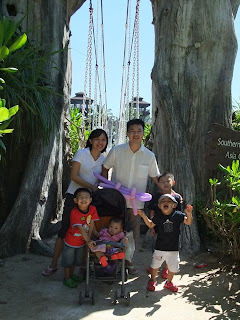 The attractions were much too expensive for a jean gang of 5 adults, 3 kids and 1 toddler to go. So the beach was really good enough. 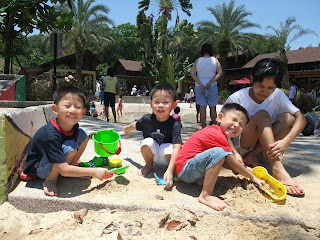 Moreover, Palawan Beach has Animal and Bird Encouters that adds on to some attractions. This was what Eliza was doing while the show was going on. 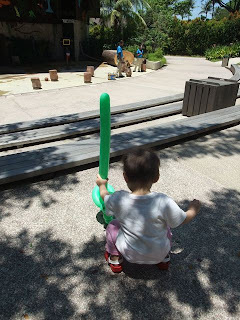 She watched the monkeys for a while and went on poking the balloon on the ground, stopping occasionally to applause when she hears it. We were afraid it was going to rain cos the weather report showed 80% chance of precipitation. So i was praying for that 20% chance of non-preciptation. God brought super sunshine weather that day. It was almost cloudless and while my mil said it was such a hot day, i was glad for the perfect weather for a day out at the beach. They were at it for a long long time....from the time Eliza was playing with water till the time she woke up...that's about 2hours! 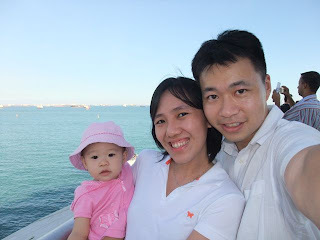 After that we took a walk to the Southern most part of asia. 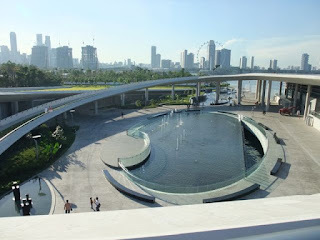 After snacks, we drove over to the Marina Barrage. I love my new Fuji F200 camera. Didn't know how fantastic wide-angle lenses are until i saw what i took. The colours were really great too. Not the best solution...cos it was quite windy...but still she had a splashing good time..again. I was glad to be out! After work times are short. This is what usually happens when i come home from work. 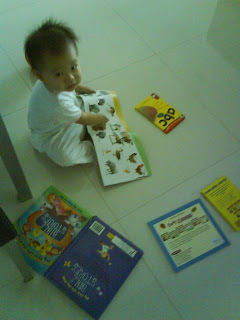 830pm ~ Mummy's play time with Eliza - we'll play in her room, or i'll show her flashcards. 9pm ~ Milk & off to bed. ~ I'll get Eliza to say goodnight to everyone which nowadays she doesn't do the goodnight sign but she'll give flying kisses to everyone instead. ~ I'll also get her to pick a book. Most of the time it's the "Going to bed book" by Sandra Boynton. Guess what is the most interesting part of her book? This hole she made biting the book spine when she was much younger. She'll never fail to point it out to me when she flips to that page. Till now i have not succeded reading the book from the first to the last page. She just flips it all over the place! Oh she also loves to point to the porthole in the book. Funny...why she keeps pointing to it. ~ Then i'll get her to pass me the book to keep, which she'll show some interest in keeping but still holds on to it till i switch off the lights and she somehow unknowingly forgets about it and i hide it away from her. 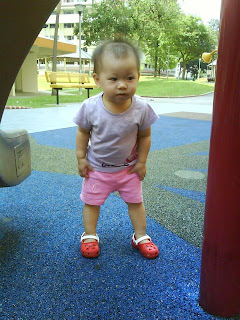 ~ Change diapers and put moisturiser on her feet. She'll point to her diapers or to her legs and do a rubbing action if we missed it out. Amazing how nowadays she knows what's next for the day, whether it's milk or mealtimes or nap times. Easing her into it is less of a battle and less of a need to cajole compared to last time. 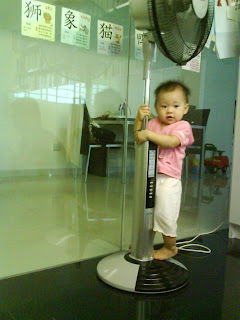 If we cue her into it, she'll go to the rightful places (try to climb into her cot, go to her high chair) and wait. She knows that my FIL brings the newspapers back when he comes home in the evenings and she'll rush to take it from him to give to my MIL. She recognizes my my in-laws, my SIL, her cousins, and of course mummy & daddy when she points them out in the family photo we have. She'll even point to the clothes that's hanging to dry and identify whose shirt it belongs to. She knows some things should not be touched and will move away from it if we say no or if we give a disapproving tone/look. Just like the ipod at my bedside that she's always so interested in...then again, i feel like she's starting to test her limits. Recently she has also begun to kiss us more often. I think it came with her doing the flying kisses more often too. The thing is that she'll definately kiss us on the lips. Most of the time when i kiss her, it's on her cheeks, so why does she always kiss us on our lips? Anyway she's so sweet, sometimes she'll just turn to me and surprise me with a kiss. Previously, she would kiss all the animals she see on books or the stuffed ones but getting her to kiss us was so difficult. Finally, she's waving bye bye...i heard her say 'byebye' twice so far but it's rare. Still the waving seems to have ease our separation when i go off to work. 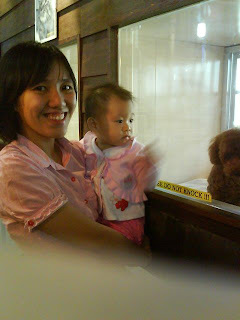 I'll tell her i need to work today and will see her again at night, so say bye bye to mummy..and she'll be ok about it. So far it has worked this week..at least. So nowadays when people ask me how she is, i'll just say "Fun"! Cos she really is fun...and we all so enjoy her. It was a busy weekend....first i brought her to Vivo, also to meet Y for lunch and i had planned for some places Eliza could go besides the shopping part. 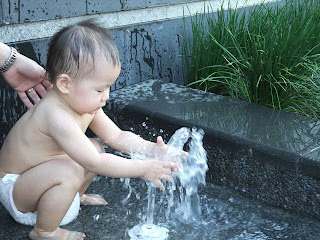 Then it was to the water play area. 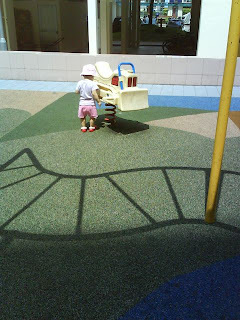 I had wanted to let her play at the playground but it was soo hot, the play equipments seems quite baked. The water was perfect, even though it means letting her into the hot afternoon sun. It took a while for her to warm up to play, she was so intersted watching the girls play and yet so hesitant to go ahead and let loose. So after much encouragement, she finally did..and she sure had fun! 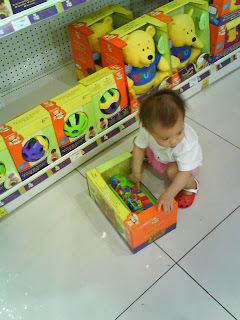 After that it was a trip to toy 'r' us, this was much larger than TM and still she choose the same toy she picked up at TM toy 'r' us! After that we went for my cell BBQ which i would have loved to stay longer and eat the delicious chicken satay. just that Eliza hadn't slept since 1pm (too many people in the house..and she was too curious to fall asleep), i had to leave the BBQ at 9pm. This is Eliza enjoying the ride with daddy. 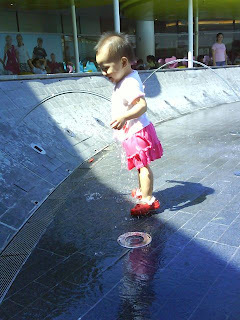 On Sunday we took a trip to Parkway, also cos daddy wanted to see see look look a condo in the area..so we checked it out and there were so many water features and pools in the area, i was trying to get Eliza to go explore. So mummy & daddy, can i have a bathtub like that??? Now that i'm working 4-day weeks. It seems like I'm missing out on a lot of fun trips we can do outside and even lazy days at home. I've enjoyed it during my MC days but then again...i was so unable to carry her, we couldn't really go out much for good sunshine and outdoor air. So left with 3 non-working days, i really try to make a point to make Friday Eliza-day with mummy. It's our day together. Weekends are quite busy too with cell, cousins coming over, dinner at mum's place, church on sunday, outings with daddy...just with more people, that is. So friday is a leisurely day, without any particular programmes and i try to go out with her to let her walk about and see new stuff. 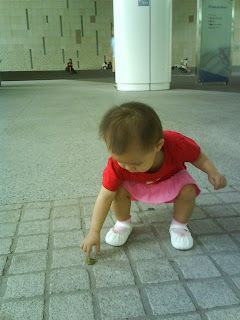 It's so different from last time when she could only crawl and we wouldn't let her on to the ground. We just popped over for some sea air after dinner and also so that Eliza can try out her walking skills. It was also Valentine's day actually. And it was nice being out as a big family. We walked to the Big Splash area where the car boot sale was going on and I was trying to point out a cute white dog to Eliza. The owners were nice to let their dog come closer and let Eliza touch it. No longer is she afraid of dogs...ok...she even wanted to 'cha1tou2' it and kiss it. 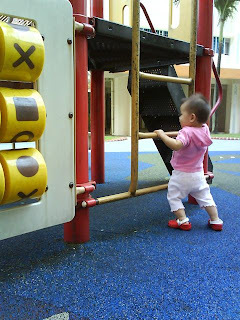 To some extent, i don't get too particular about what she touches as long as it's not poisonous or too dirty...so holding the rail is fine...and i had to emphasize that cos grandparents and daddy is more particular. Now's the time to explore! 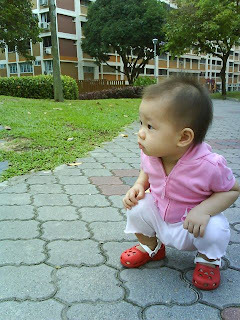 Squat to take a better look? But this time she was sleeping while she fell off, 90% should be it. She was surrounded by pillows on her left and at her legs, and on her right was me. Ww wasn't at his place cos he has woken up to prep for school and was in the study room doing his QT. Ww said she probably sat up and crawled & rolled around the bed till she slipped off on his side of the bed. I was super sound asleep and was woken up by a thud. By the time i had gone to her she had started wailing. I found her in a 'tortoise' position, so i'm hoping she didn't knock her head. My mil said that the 'old people saying' is such that when kids fall off the bed while sleeping it's ok...or something like that. It's more of the shock of being woken up in such a manner. She kinda just needed to be pacified and well..since it was already about 630am...that marks the start of another exciting day. Let's hope this doesn't happen again...seems like the pillows doesn't work anymore uh? Nowadays she'll dare to get off our bed even when we're fast asleep...no more sitting on the bed to cry. One morning i woke up earlier than her, and while i was in the kitchen, she came out of the room looking for me...and signing to me her 'milk' sign. So fun...having her to communicate to us by pointing and signing even though all she can say so far is 'mama', 'baba', 'ah-ma' and lots of Eliza-gibberish.